The November 28th Christie’s Magnificent Jewels Hong Kong auction saw some pretty impressive results for fancy colored diamonds and for rubies, but the real headliner was the hammer price realized for an incredibly rare 14.93-carat Fancy Vivid VVS1 pink diamond. The diamond, described by Christie’s as the “Picasso of the Pink Diamond world,” sold for an incredible $31,861,000 – approximately $2.13 million per carat. The diamond, referred to as The Pink Promise Diamond is a stunning pink oval stone with mixed cuts. Its Fancy Vivid Pink colour (as opposed to Fancy Intense Pink) is a designation given by the Gemological Institute of America (GIA) and represents the most prized colour grading in pink diamond history. The oval stone was set in a platinum ring and surrounded by diamonds. It was estimated that the ring would sell for between $28 million and $42 million. The Fancy Vivid pink diamond was originally purchased by gemologist and jeweller Stephen Silver, who is known for his keen eye for gemstones. 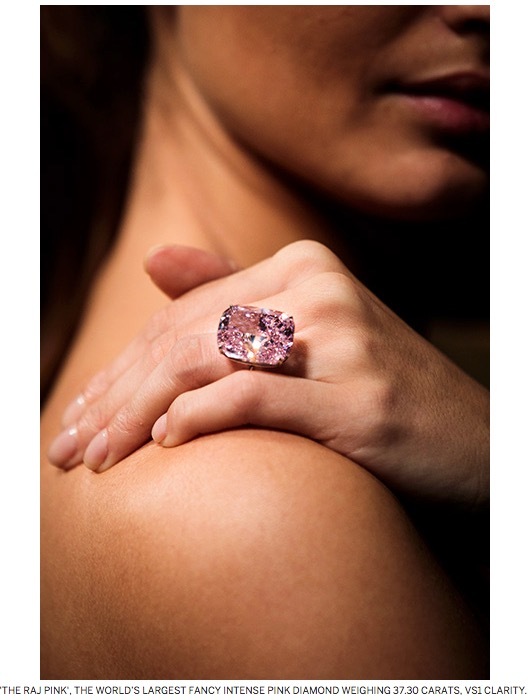 When he bought the stone (for an undisclosed sum) in 2013, it was originally a 16.21-carat Fancy Intense pink. However, Silver believed that the stone could achieve a higher colour rating if it were cut differently to allow more light through it. Silver turned to a master gem-cutter and together they spent several years planning how to cut the rare Type IIa pink diamond. Diamonds are categorised into two main types: I and II, depending on the nitrogen present it the structure. Type II diamonds are divided further into a or b, meaning they contain very little nitrogen, with IIa being the purest. Cutting the 16.21-carat stone was risky because if they could not achieve a higher colour rating, they were basically tossing away millions of dollars in lost carat weight. The risk paid off. The stone was re-certified by the GIA after its cutting from 16.21 carats to 14.93 carats. It went from Fancy Intense Pink to the much rarer Fancy Vivid Pink rating. Additionally the Type IIa pink diamond achieved VVS1 clarity – the grade just beneath “flawless.” The higher grades in colour and clarity boosted the value of the diamond exponentially. According to the GIA, only one in every 1,000 diamonds mined can be classified as Fancy colour diamonds. This stone is Fancy Vivid – the highest possible colour mark, and it is a large size, which is very rare for pink diamonds. The remarkable remake of the diamond that Stephen Silver promised he could make brighter and more intense, yielded it the name, The Pink Promise. This was one in a string of important coloured diamond journeys for Silver. He has worked with, or re-imagined a host of important diamonds including a Fancy Vivid orange diamond known as “The Million Dollar Pumpkin” and he acquired the Cullinan Blue Diamond Necklace in 1992, which he subsequently donated to the Smithsonian National Museum of Natural History in 2010. This diamond sale fell just short of a world record per carat price for pink diamonds. In the December 2009 sale at Christie’s in Hong Kong, a Vivid Pink, a cushion-shaped fancy vivid pink 5-carat diamond sold for $2,155,332 per carat, and set a per-carat record price. The diamonds, formerly in the collection of the von Donnersmarck family, consist of a 102.54-carat cushion-shaped diamond and an 82.47-carat pear-shaped diamond. They are being offered as a single lot with a pre-sale estimate of $9 – $14 million. “These stunning diamonds carry with them a fascinating story, full of romance and determination over adversity, which could have inspired some of the greatest novels and operas, from Manon Lescaut to La Traviata,” said David Bennett, worldwide chairman of Sotheby’s International Jewellery Division. The Donnersmarck Diamonds were part of the collection of La Païva, Countess Henckel von Donnersmarck (1819-1884), arguably the most famous of the 19th-century French courtesans, Sotheby’s said. Born Esther Lachman, the Russian native of modest means arrived in Paris at the age of 18 and was introduced to the city’s cultural and artistic circles. She gained the friendship of many artists, including Richard Wagner, Hans von Bülow, Théophile Gautier and Emile de Girardin. In the late 1840s, she met the Portuguese Marquis Albino Francisco de Araújo de Païva. They were married in 1851 but the marriage lasted only one day. Now known as La Païva, It was around this time she met her future husband, German nobleman, Count Guido Henckel von Donnersmarck (1830-1916), one of Europe’s richest men. Their relationship was the talk of Paris high society and in 1871, the two were married. 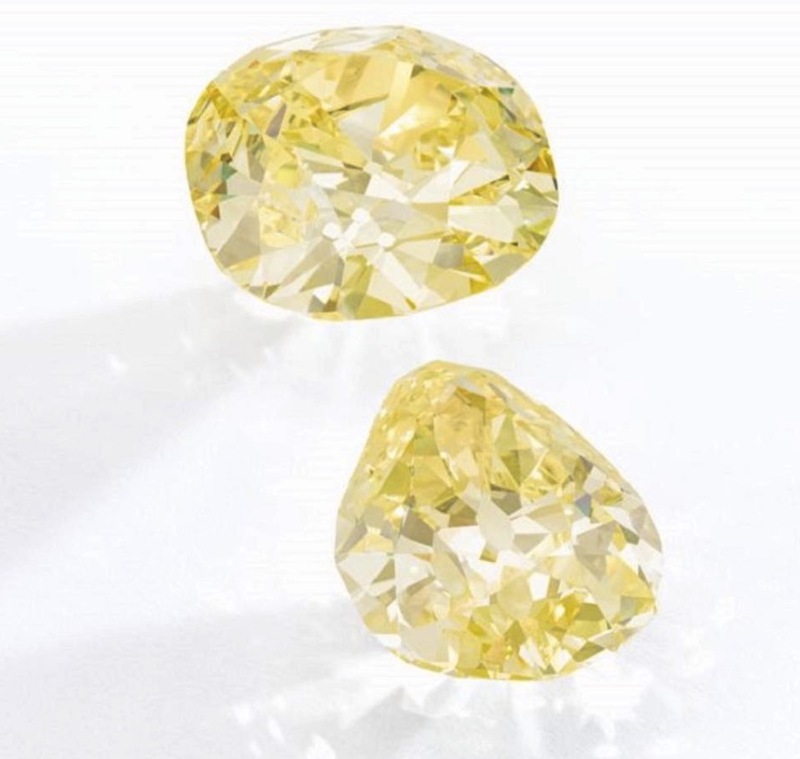 Among the jewels von Donnersmarck gave to La Païva during the course of their marriage was the two yellow diamonds now known as the Donnersmarck Diamonds. Following La Païva’s death in 1884, the count, who became prince in 1901, retained ownership of the diamonds. They remained in the Donnersmarck family for more than a century until they appeared at auction at Sotheby’s in 2007 where they sold for approximately $7.9 million. They will appear again in November after having been in a private collection for the past 10 years. In the same sale, Sotheby’s is offering “The Raj Pink,” the world’s largest known fancy intense pink diamond, weighing 37.30 carats with an estimate of $20 – $30 million. LONDON – ‘The Raj Pink’, the world’s largest known Fancy Intense Pink diamond has been unveiled in London today. The exceptionally rare diamond, which weighs 37.30 carats, will take centre stage in the Magnificent Jewels and Noble Jewels sale in Geneva on 15 November. The rough diamond which yielded ‘The Raj Pink’ was studied for over a year after its discovery in 2015. It was then entrusted to a master cutter, who brought the diamond’s innermost beauty to full display by crafting it into an exceptional cushion-modified brilliant cut. The Gemological Institute of America (GIA), which certified the diamond, characterized it as an “astonishing stone”, describing its hue as “a very bright and ravishing fancy intense pink colour”. It continued, “For a diamond to display strong, unmodified pink colour like that observed in ‘The Raj Pink’ is rare, particularly at so considerable a weight”. The discovery of a gem-quality pink diamond of any size is an extremely rare occurrence. Of all diamonds submitted to the GIA each year, less than 0.02% are predominantly pink. ‘The Raj Pink’ will be on view in London from 13–17 October alongside other highlights from the Magnificent Jewels & Noble Jewels sale. A career gemologist, Anna Cisecki has held some of the most precious stones ever unearthed. As Executive Director of Australian Diamond Portfolio, she’s teaching investors to recognise their true value. Beautiful, enigmatic and impossibly rare, pink diamonds have become one of the most sought-after and valued assets in the world. 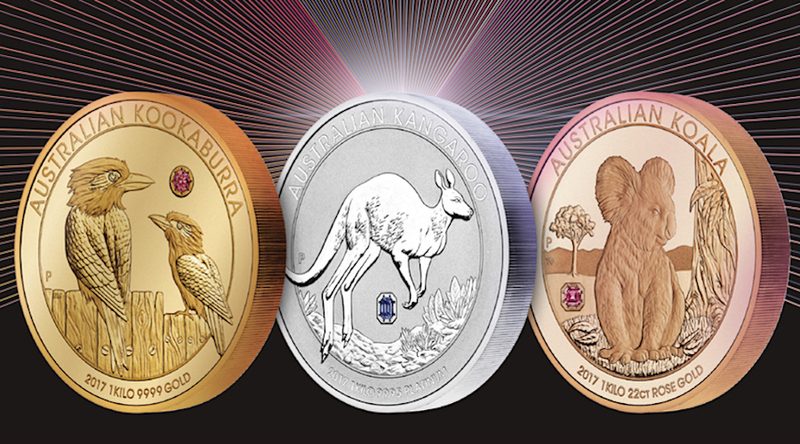 And, it’s not by chance that investors seeking to diversify their portfolio are looking at these special little pink gems. Statistics published by the Fancy Colour Research Foundation (FCRF) confirm rare intense and vivid pink diamonds have experienced an incredible average annual growth of more than 14 per cent since 2005, a total price appreciation of more than 485 per cent. “Pink diamonds have outperformed practically all investment classes as consumers and investors continue to view them as a long-term safe investment option, an effective hedge against inflation and a unique opportunity to create value and gains in a portfolio,” Ms Cisecki said. The Rio Tinto-owned Argyle Diamond mine in Western Australia is the only significant source of ultra-rare pink diamonds in the world, producing almost 95 per cent of global supply. However, in less than five years it will be time to say goodbye to one of Australia’s most famous natural resources. After more than four decades of production, Argyle’s supply of pink diamonds is nearing exhaustion and the mine’s life is drawing to a close in 2021. 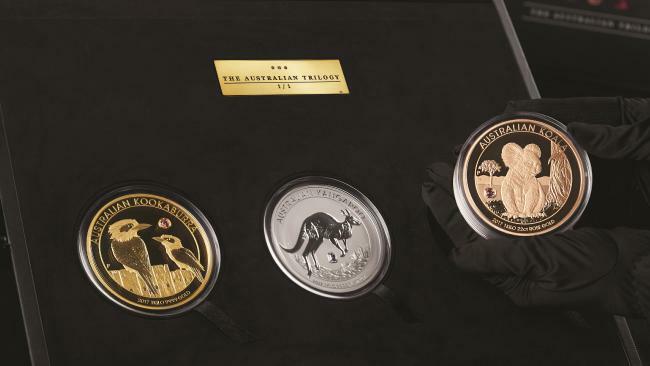 But this is news which comes with a silver lining for investors and firms such as Australian Diamond Portfolio with its boutique team of specialised investment diamond advisors. Ms Cisecki believes much of the reason for Australian Diamond Portfolio’s success has come because of the need for a specialist investment firm to simplify the investment process around pink diamonds. “Rare pink diamonds are not just the realm of the uber-wealthy; investors of all types and levels of the market are getting involved from small private retail investors and wealth managers to financial advice groups and family offices. Given the ongoing uncertainty in global financial markets and the demonstrated return potential, pink diamonds are indeed an asset class that every investor should be looking at. In another decade the pink diamonds from Argyle will emerge as the new Faberge egg – the thing legends are made of. 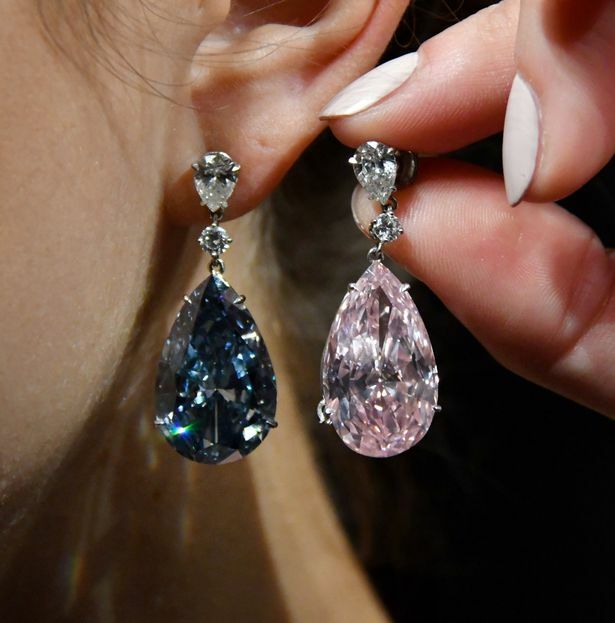 Auctioneer Sotheby’s has sold the most expensive pair of earrings in the world, at a combined price of A$78.3 million. Sotheby’s inaugural sale of magnificent jewels in Geneva was headlined by ‘The Apollo and Artemis Diamonds’, becoming the most valuable earrings ever sold at auction. There was dynamic bidding on the phone, online and in the room throughout with over 90% lots sold and two thirds over the high estimate with multiple records. “In the last five to 10 years, the price seems to be escalating rapidly. And we just sold this world record stone, and that was a pink diamond,” said David Bennett, worldwide chairman of Sotheby’s International Jewellery division, ahead of the auction. The pair is made up of two pear-shaped diamonds; one Fancy Vivid blue diamond named Apollo, which sold for A$57.4 and one Fancy Intense pink diamond named Artemis, which sold for A$20.9 to the same telephone bidder. The two diamonds were sold as separate lots, but will remain together as a pair. The 14.54-carat Fancy Vivid blue diamond, Apollo, was undoubtedly the star of the show, with its unbelievably rare Fancy Vivid Blue colour. The world’s most expensive blue diamond, the 14.62-carat Oppenheimer Blue, is a Fancy Vivid – it sold for A$80 million at Christie’s in Geneva last May. When considered as a pair with the sensational Artemis, a 16-carat Fancy Intense pink diamond, the set can be described as being in a class of its own. “These exquisite coloured diamonds are enormously rare and each is a wonderful stone in its own right. Together, as a pair of earrings, they are breathtaking. We have named them after Apollo and Artemis, a twin brother and sister of great power and beauty who were among the most widely venerated of the Ancient Greek deities. These are diamonds of great distinction, with extraordinary presence, and we are honoured that Sotheby’s has been chosen to bring them to auction,” said David Bennett, worldwide chairman of Sotheby’s International Jewellery Division. “The Apollo and Artemis Diamonds [were] the stars of our May sale in Geneva – by far the most important pair of earrings ever offered at auction,” said David Bennett, worldwide chairman of Sotheby’s International Jewellery Division. The Fancy Color Diamond Index for the first quarter of 2017 indicates pricing stability across most fancy color diamond categories, according to the Fancy Color Research Foundation (FCRF). The main exception was blue fancy color diamonds, which saw a 1.9 percent price increase in the first 3 months of 2017, continuing the trend of 2016. During the same time, yellow and pink fancy color diamond prices remained largely unchanged. 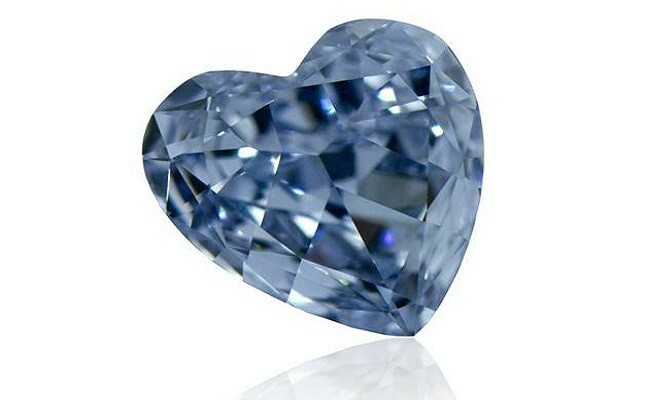 Overall, the Fancy Color Diamond Index for all shapes and sizes was up 0.2 percent for the period. The strongest performing price categories during Q1 2017 were fancy intense and fancy vivid blue diamonds across all carat sizes. On a year-on-year basis, when compared to Q1 2016, the Fancy Color Diamond Index is up 0.7 percent, with fancy blue and fancy pink diamonds up 5.7 percent and 0.8 percent, respectively, and fancy yellows down 2.5 percent. As in Q4 2016, across all color segments fancy intense and fancy vivid stones demonstrated robust price increases, which were offset to some extent by price declines of color diamonds in the “Fancy” category. . 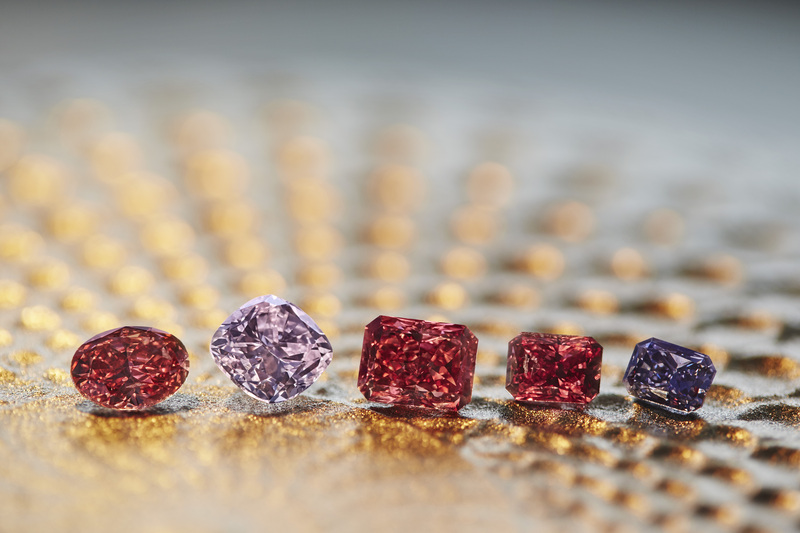 The FCRF tracks pricing data for yellow, pink and blue fancy color diamonds in three key global trading centers – Hong Kong, New York and Tel Aviv.